A bit of imagination was required to enjoy Friday's walk in the Mamores. Without the wind and rain battering into your face, and without the low cloud obscuring the (probably excellent) views, these narrow ridges would have been a great day out. We parked the hired Skoda (don't be put off, this was a classy German-ish automobile) at Mamore Lodge (map) and headed up the track. We crossed Allt Coire Na Ba at the foot bridge and climbed back to a track which contoured around Leachd na h-Aire. We left the track where a path forked off left, crossed Coire nan Laogh, and started to climb the SE spur of Sgor Eidle Beag. The morning's tea and porridge (brewed and cooked up by Alastair - the most alert in the mornings) was put into use and we steadily gained height whilst the weather steadily got worse. Soon we had our axes out and were kicking our way up through several snow fields. More straightforwardly, we plodded NW and came up onto the 1062m top and into a more fierce westerly wind. We braved the wind and and followed a narrow and snowy ridge due N. Locating the summit of Binnein Mor involved scrambling over several rocky protrusions that looked like suitable candidates. We back tracked along the ridge, with the wind working its magic on the opposite shoulder, passed the top and took in another narrow (but not quite as narrow) ridge in strong (but not quite as strong) wind. Jamie's (apparently 4 man) bothy bag came out and we got inside in 'bus seat' configuration and scoffed sandwiches and malt loaf. Finishing the ridge we found Na Gruagaichain's summit with no problems and bum-slid most of the way down the S ridge. Steep heather was less suited to the backside so we trod carefully back down to the track we had taken on the walk in. Over tea and biscuits in the bar of Mamore Lodge and, in armchairs in front of an open fire, we talked over routes for the next day. I had originally hoped to head up to climb the Forcan ridge, but none of us fancied a grade II exposed ridge it in the wind we had just tasted. Instead we decided on a gully climb on the Ben. With plans decided we headed to Fort William and stayed in Calluna, the bunkhouse run by Alan Kimber. We ate great mounds of pasta and bolognese and drank screwdrivers watching a Jackie Chan film. Then, exhausted, we turned in for an early night. Whilst we were asleep a couple of other climbers arrived in our dormitory and went to sleep. In the middle of the night one of them woke himself up (and us too) from a nightmare with a loud scream. Hoping our climb wouldn't lead to the similarly traumatic dreams, we set off on Saturday morning for Ben Nevis. Taking the well trodden route from the north face car park through the corner of Leanachan Forest and following Allt a Mhuilinn. When it was possible to cross the river we had a good view of the Castle and headed up towards the coire. Once we had gone up the heathery bit we found a flat spot and put harnesses and helmets on and got an axe out for the diagonal snow slope and scramble up into the coire. From there we got crampons on and walked up to investigate South Castle Gully. We roped up and stomped up the first 60 odd metres of the climb, at this point we came across a chockstone, a steeper snow field and a large sloping slab of rock. Water cascaded off the slab and into a hole in the snow, where it disappeared off under our feet. To the left there was a thin strip of ice. Alastair and I climbed up the chockstone and took a look at the strip of ice. I was pessimistic about progress but Alastair put in a dead-man (they look like this) as a belay and had a go. At the first opportunity he got out an ice screw and attempted to place it. A one metre section of the ice came away from the rock and a crack began where the ice screw went in. Alastair backed off. By this time Jaime and Paul had caught up and Jamie decided to have a go too. After switching ropes with Alastair he took up his tools and climbed up onto the ice. Made careful but steady progress past the rotten ice, hacking his axes in solidly into the better ice above. He kicked his front points into the ice and it gave way. He fell with a bump into the hole (where the water went) but was unhurt. I was glad that he was OK and that the belay had not been tested in anger. We then retreated out of the gully (definitely not in Grade I condition!) and headed up North Castle Gully. This was steeper and, after an enjoyable chockstone pitch, a straightforward snowplod. We topped out, with no cornice, and got the bothy bag out for lunch. Getting in the bothy involved all getting inside and sitting down together. This squished us into a space 4 men are not designed to occupy. It was not comfortable, like quartets in the fetal position, but we were warm. After posting pancakes, bananas, and sandwiches, we all had to stand up together leaning out, a feat we miraculously achieved and escaped from the bag. Then we hiked up to nigh on the summit of Carn Dearg to find the zig-zags and with tired legs make it back down to the half-way lochan, the river crossing, and back along the track to the car. We stayed in the Corran Inn bunkhouse and dined on curry, rice, naan, and cold beer. Then we showered and headed out to the bar. It was shut. Our disappointment escalated when we discovered that we had left the orange juice behind at the last bunkhouse. There was only one thing for it: we had to squeeze 12 oranges by hand to make our own fresh juice, add some ice and vodka, and switch on the telly for The Bourne Identity. After a sound nights sleep (with no screams) we woke a little later than the previous days and caught a gondola ride up the side of Aonach Mor. From the end of the gondola we contoured around the hill to the E. This eventually led to Coire an Lochan but was a poor (and time consuming) choice. We found the gullies in the fog, and they were all full of people, we asked directions to Right Twin which we fancied trying. Sadly, when we found it, someone had just started it and a look at the time meant that we had little choice than to head up Easy Gully and head back to the car. Easy Gully was quite steep at the top but lived up to its name and a small cornice was turned on the right. We followed the ski resorts sorry looking slopes down to the gondola and back to the car. 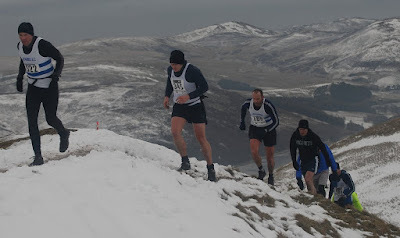 Took part in the Carnethy 5 hill race (results, photos and more photos) on Saturday with 499 other runners. The race is loosely connected to the Battle of Roslin in 1303. The start was quite a thing with bagpipes, flags, swords being swung about and a proper starting gun. Then there was a rumble of 1000 feet pounding the bog as we set off, like a stampede, over the slush and up to the style at Charlie's Loup. Then we began the long slog up the side of Scald Law. Powered by a romantic breakfast, three more peaks -South Black Hill, East Kip and West Kip- were taken in quite easily. The steep decent off West kip saw many runners trip, cartwheel and slide down on their backsides. All in all a reasonably speedy tactic. The fun continued all the way down to The Howe, but then we had to head back up a grueling last climb to Carnethy Hill. From the summit it was another mad downward dash on snow, rocks, mud, heather, and back across the slushy bog to the finish line. After a night out in town, and a few beers it was quite a struggle to get up to the Red Moss car park for 9:30am to meet up with a group from CAAC. We took in the same hills as in the race the day before, but in a different order. The weather was milder, although there was a fair bit of wind, and a good deal of the snow had now melted into even more slush. Firstly we jogged, at a fair pace, up The Avenue and along the drove road to West Kip. Then we ticked off East Kip, South Black Hill, Scald Law and finally Carnethy. We dropped off the back of Carnethy to Logan Burn, and took a route around the back of Black Hill to Easter Bravelaw Farm, across the reservoir and back to the cars. Magda fancied a bike ride so we peddled off along the old railway line down into Granton and back along the Water of Leith. By this stage the sun had come out and we spent a good proportion of the time avoiding dogs, toddlers and pensioners. Legs are pretty goosed now. Hubbard Baby Has 24 Fingers and Toes! And this little piggie...er...wait a minute. A baby called Kamani Hubbard could make a fantastic pianist because he has just been born with 6 fully functioning fingers on each hand. Polydactylism affects around 1 in 500 babies. We headed up to Pitlochry to celebrate Magda's birthday with a weekend of B&B, bikes, curry, champagne, strawberries, pubs and card games. We took the train up to Pitlochry on the friday night, stayed in a B&B and, after a big breakfast fry-up, pedaled off around Loch Tummel. The outward leg to Foss was rather undulating. One or two long uphill stretches were happily followed by equally long downhill ones. Rain held off for us but it was pretty chilly. We arrived back in Pitlochry just before 1pm and had a big lunch in a pub. We then had a bit of a mooch in the shops before scooting off to a great old pub in Moulin for a drink. By the time we got back, showered, relaxed, watched a crazy TV show where people have to jump across a swimming pool on inflatable red balls and drank some wine, we were ready for a curry. A perfectly proportioned structure of striking beauty and a bridge. Sunday we cycled to Dunkeld, where there is a great bridge built by Thomas Telford, and we stopped in another cool pub for tea (Magda) and beer (moi), then we got the train home.